When Thomas A. Dooley died of cancer on January 18, 1961—one day after his 34th birthday and two days before the inauguration of America's first Catholic president—a Gallup poll ranked him third among the world's "most esteemed men," right behind Dwight Eisenhower and the Pope. A typically effusive editorial tribute to the famed "jungle doctor of Asia" proclaimed: "Tom Dooley is survived by his mother, two brothers, and three billion members of the human race who are infinitely richer for his example." Monsignor George G. Gottwald, who delivered the eulogy at the Pontifical Requiem Mass for Dooley, compared him to Christ, noting that "the greatest life that was ever lived was 33 years. Dr. Dooley was 34." Congress posthumously awarded Dooley the Medal of Honor, President Kennedy gave him the Medal of Freedom, and a popular groundswell built to have the doctor canonized. In all, the nationwide paroxysm of grief that greeted news of Dooley's demise was a fitting response to the death of the man whom many Americans had come to regard as a modern-day saint. Within a decade, however, Dooley was all but forgotten. His books, which sold millions of copies during his lifetime, disappeared from stores and gathered dust on library shelves. Hollywood studios had plans to make a film of his life, but nothing came of them. Campaigns to promote the cause of Dooley's sanctity in the Roman Catholic Church fizzled. The maxim about all glory being fleeting is applicable to the whole of modern American culture, but rarely more poignantly than to Tom Dooley. There are several reasons for Dooley's fall into obscurity. First of all, he left no lasting monument to his life's work. The Medical International Cooperation Organization (MEDICO) that he founded proved dependent on Dooley's charisma for money; it collapsed within a year of his passing. Another determinant was his sexuality—never completely hidden but only a matter of public record after his death. One of Dooley's classmates at Saint Louis University High School recalls a teacher's lesson that "homosexuality is something that only happens in hell," an indication of how gay men and women were viewed by many Americans at mid-century, to say nothing of the conservative Catholic circles from which Dooley drew his staunchest support. Post-obit revelations that the wholesome "Dr. Tom" was not only gay but promiscuously so undoubtedly contributed to his erasure from collective memory. But probably the most significant reason for Americans' amnesia with regard to Dooley was the Vietnam War. No one played a larger role than Dooley did in moving Vietnam to the forefront of public concern in the United States. For millions of Americans, his 1956 book Deliver Us from Evil was their introduction to Vietnam. Dooley's graphic accounts of communist atrocities against Christians profoundly influenced American attitudes toward a country that few policymakers would have been able to locate on a map at the onset of the 1950s, but which had become the logical testing ground of U.S. credibility in the Cold War as the following decade dawned. Dooley, of course, did not "cause" the Vietnam War, but he did influence the body of information that was available when war began, and he—more than anyone else—managed to make a large segment of the American public care passionately about preserving South Vietnam from communist tyranny. Dooley first traveled to Southeast Asia in 1954, assigned to the U.S. Navy's program of aid in transporting North Vietnamese refugees. The Geneva Accords sealed by the French and the communist Viet Minh in July of that year had provisionally divided Vietnam at the 17th parallel and specified that all Vietnamese who wished to relocate either north or south would be permitted 300 days to do so. Almost a million Northerners--nearly all of them Catholics from the Hanoi Delta--chose to migrate below the parallel, and the United States organized a task force of some 50 ships to help transport them. 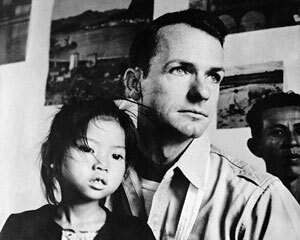 Dooley, then a 26-year-old Navy lieutenant, was put in charge of building refugee assembly camps in Hanoi and of providing their medical services. He and his fellow officers waged a furious campaign to stamp out contagious diseases before the hordes of exiles boarded the Navy's vessels. After returning to the United States, Dooley published an account of his experiences, first in condensed form in Reader's Digest and then as Deliver Us from Evil. It caused a sensation, becoming the great early bestseller on Vietnam. Nothing until The Pentagon Papers in the summer of 1971 received comparable readership. Racist and sketchy in the extreme on the complexities of Vietnamese culture and politics, Deliver Us from Evil nonetheless retains a capacity to affect the reader on a visceral level that gives some hint of how powerful its impact must have been in 1956. Dooley's description of a Vietnamese teenager whose legs were pounded by rifle butts—"the feet and ankles felt like moist bags of marbles"—still provokes a shudder. His purported quotation of a communist radio broadcast can still rankle: "This is an American. His head is a blockhouse. His beard is barbed wire. His eyes are bombs. His forehead is a nest of artillery and his body is an airfield." It was the atrocity stories in Deliver Us from Evil that attracted the most attention and commentary. Dooley told of how the Viet Minh jammed chopsticks into the ears of children to keep them from hearing the Lord's Prayer, cut off the tongue of a religious instructor whom they accused of preaching "heresy," and pounded nails into the head of a Catholic priest—"a communist version of the crown of thorns, once forced on the Saviour of whom he preached." Catholic priests, Dooley wrote, were by far the most frequent targets of Viet Minh terror. He claimed to have discovered one priest whom the communists had left "a mass of blackened flesh from the shoulders to the knees. The belly was hard and distended and the scrotum swollen to the size of a football." Critics accused Dooley of manufacturing his Vietnamese Grand Guignol out of whole cloth, but these charges only became public decades after his death. Six U.S. officials who were stationed in the Hanoi-Haiphong area during Dooley's tour of duty submitted a lengthy, albeit secret, exposé to the U.S. Information Agency in 1956 in which they held that Deliver Us from Evil was "not the truth" and that the accounts of Viet Minh atrocities were "nonfactual and exaggerated." The report was declassified in the late 1980s. William J. Lederer, author of the Cold War bestseller The Ugly American and, as Dooley's mentor, the man who prevailed upon Reader's Digest to publish Dooley's story, told the journalist Diana Shaw in 1991 that the atrocities the doctor described "never took place." Even more persuasive were statements by Norman Baker, who served as a corpsman under Dooley's command in Vietnam and who told Shaw that he never saw anything like the gruesome spectacles detailed in Deliver Us from Evil. Nonetheless, Dooley tapped into powerful emotional currents in 1950s America, which was experiencing a massive religious revival inextricably bound up with the anxieties of the Cold War. It was not difficult for Americans at the time to believe that "godless" communists had committed such fiendish acts, and Dooley's horror stories only confirmed the widespread perception, memorably articulated by evangelist Billy Graham, that communism was "inspired, directed, and motivated by the devil himself, who has declared war on Almighty God." Young, idealistic, and (conveniently) very handsome, Dooley became a genuine superstar, commanding top-tier lecture fees and receiving thousands of fan letters a day. The Navy doctor's Catholicism, which might have limited his appeal in an earlier era, worked to his advantage during the Eisenhower years, when—as Charles R. Morris, James T. Fisher, Patrick Allitt, and other scholars have demonstrated—Catholicism was synonymous with 100 percent Americanism. Dooley wisecracked during a 1959 fund-raising tour for his clinic in Laos that he was uniquely qualified to match wits with communist guerrillas "because I was educated by the Jesuits," and his largely non-Catholic audience roared its approval. For American Catholics, the 1950s were halcyon days. Catholics' anti-communist credentials looked impeccable in waging Cold War, and there was no more charismatic Cold Warrior than "Dr. Tom." Dooley's popularity was at its zenith when he died in a New York hospital on the eve of Kennedy's Camelot. JFK capitalized on the torrent of publicity attending the doctor's final days; in proposing the creation of the Peace Corps, Kennedy cited "the selfless example of Tom Dooley." Few would have argued in 1961 that Dooley's career furnished a fitting example for energetic and idealistic Americans to follow. Years later, with the United States mired in a seemingly unwinnable conflict in Vietnam and the divisions in American society more pronounced than at any time since the Civil War, matters looked different. In a stinging 1969 article for the Catholic magazine The Critic, Nicholas von Hoffman called Dooley "too preposterous a figure for youth to identify with" and blamed the doctor's "ethnocentric fusion of piety and patriotism" for helping to create "a climate of public misunderstanding that made the war in Vietnam possible." Dooley, von Hoffman charged, "contributed to the malformation of our knowledge and moral judgments about Southeast Asia" by depicting the region's conflicts in simple terms of good versus evil. Such "muddled, primitive political thinking" had led to a war that ravaged America's spirit and squandered the immense moral capital the United States had accumulated by defeating the fascists in World War II. Von Hoffman predicted that "eight years hence, Tom Dooley will appear so bizarre, . . . so much a defunct social type, that no one will make the effort to remember him." This forecast proved accurate. None of the major histories of the Vietnam War published from the mid-1970s through the early 1990s mentions Dooley's name. But interest in Dooley has revived in recent years among scholars seeking a fuller understanding of why the United States expended so much blood and treasure in an area of such apparent strategic and economic insignificance. Traditional balance-of-power and materialist interpretations having failed to render the Vietnam War intelligible, historians are now employing categories of analysis traditionally consigned to "social history"—like race and gender. The meteoric career of Tom Dooley suggests another vital, hitherto unexplored dimension of America's longest and most divisive war: religion. Seth Jacobs, an assistant professor of history at Boston College, teaches courses on the Vietnam War and the Cold War. Photo: Tom Dooley in Vietnam, in an undated photo.